The best album you never heard in your life (thanks, Frank). 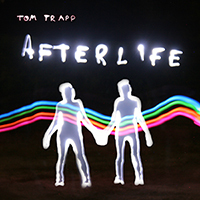 “Afterlife” is a 60-minute suite composed for the Metropole Orchestra in Holland. That’s good news! So here’s some bad news: you’ll probably never hear it, unless you make friends with me personally and come over to the house. Let’s just them “paperwork problems.” The word “legal” sounds so heavy. If I’m ever able to release it, it’ll be chopped down to 45 minutes, I think. If not, I’ll do my best to rerecord, I promise. Anyway, the story go like ‘dis: Creative Catalyst (Steve Vai‘s cool title, not mine) Co de Kloet, one of the coolest producer-type dudes I know, to whom I owe a debt of gratitude, commissioned the suite. This was after working together on a Vai project a while ago, and I guess he liked me enough. I wrote the music and Co got it conducted by the rugged trendsetter Jurjen Hempel. The Metro recorded it, and there it sits, on a hard drive. 48 kHz/24 bit, so at least it’s high-quality. At least that.